Throughout the past several years, no other area of IT has generated as much hype, interest and investment as cloud computing. Though the term can have different meanings for different users, there's no doubt that the cloud is now a permanent fixture for end users and service providers, as well as companies and organizations of all sizes around the world. As a result, cloud computing attracts considerable coverage and attention from certification providers and companies that offer cloud-related products, such as Amazon Web Services, Microsoft and VMware, among countless others. An excellent Forbes article summarizes key statistics regarding the current cloud computing landscape along with a look to the future. Amazon Web Services (AWS) is the dominant cloud computing player, followed by Microsoft Azure, the Rackspace Public Cloud and VMware's vCloud. Microsoft is expected to grow to 30 percent of the cloud product revenue by 2018. The cloud infrastructure and platform market is projected to generate roughly $38 billion in revenue and expected to top $173 billion by 2026. And cloud services aren't limited to large corporations and enterprises. An estimated 64 percent of small and medium-sized businesses (SMBs) also use cloud-based applications, with 78 percent of businesses indicating that they are planning to buy new cloud-based solutions in the next few years. A close examination of what's available to IT professionals by way of cloud-related certifications shows a large and growing number of credentials. For 2017, the best cloud computing certifications include both vendor-neutral and vendor-specific certification options from some top players in the market. However, certification providers watch technology areas carefully and seldom jump into any of them until clear and strong interest has been indisputably established. Cloud professionals can expect to earn a healthy income. SimplyHired reports average salaries for cloud administrators at just less than $83,000, while cloud developers average $101,193 annually. Cloud architects are the big winners, with average earnings coming in at $130,000 and some salaries listed as high as $176,000. Before you peruse our list of the best cloud certifications for 2017, take a look at our overview of the relative frequency at which the top five picks show up in job postings. Keep in mind that these results are a snapshot in time. 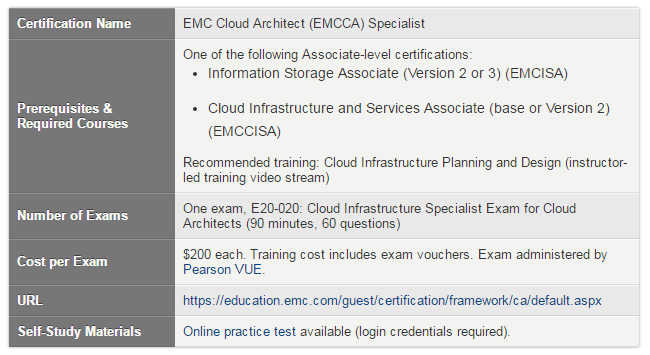 * Refers to the EMC Cloud Architect (EMCCA) certification. Searching for "EMCCA" only resulted in disproportionately low numbers. 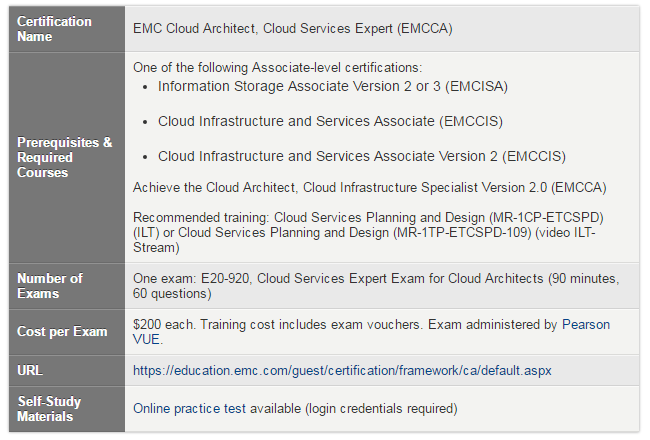 Using "EMC cloud" as a search term produces job listings that include the EMCCA certification by its acronym, refer to the EMC Cloud certification in general, and/or mention EMC cloud experience as a preference or requirement. ** The MCSE: Private Cloud credential will retire in March 2017. The MCSE: Cloud Platform and Infrastructure certification launched in September 2016 and doesn't appear in job listings yet. We searched "MCSE Cloud." Read on to learn about some of the best cloud computing certifications for IT pros available today. Hopefully this information is helpful to you. Happy hunting! In November 2011, the CompTIA Cloud Essentials certification hit the scene. It was the first wholly cloud-focused certification offered by the Computing Technology Industry Association and was developed with involvement from ITpreneurs and the Cloud Credential Council (CCC). Cloud Essentials remained CompTIA's sole cloud computing credential until October 2013, when CompTIA introduced the Cloud+ credential. We chose to feature the Cloud+ certification because it's more robust than the Cloud Essentials credential. The Cloud+ cert specifically targets more experienced cloud IT professionals (two to three years of experience is recommended) and validates both cloud computing and virtualization skills. 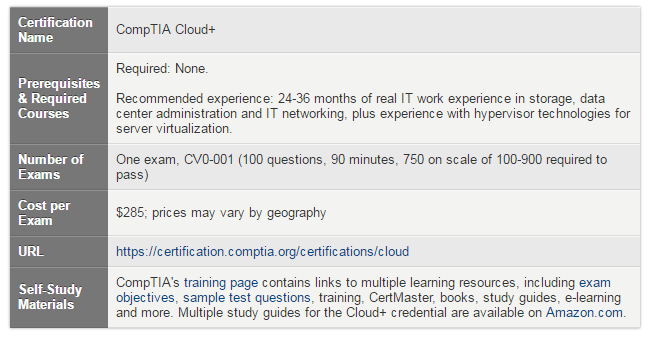 Professionals seeking this credential should have an in-depth understanding of cloud terminology and methods, IT security, and industry-best practices in both cloud computing and virtualization, and the ability to implement, maintain and deliver a cloud infrastructure. In addition, candidates should be experienced in the areas of IT networking, data center administration or network storage. Valid for three years, the Cloud+ credential is the next logical step in the certification path for those who already possess credentials such as the CompTIA Server+, Storage+, Network+ or Security+. To renew, certification holders must earn 50 continuing education units (CEUs). Microsoft is retiring the MCSE: Private Cloud credential on March 31, 2017, replacing it with the MCSE: Cloud Platform and Infrastructure credential. The MCSE: Cloud Platform and Infrastructure cert recognizes a candidate's ability to manage data centers and validates skills in networking virtualization, systems and identity management, storage, and related cloud technologies. Each MCSA requires two or three exams depending on the chosen path. The MCSA: Linux on Azure credential requires both a Microsoft exam and the Linux Foundation Certified System (LFCS) exam. Candidates must also pass a MCSE specialty exam. Specialty exams include topics such as developing, implementing and architecting Azure-related solutions; monitoring and operating a private cloud; designing and implementing solutions for cloud data platforms; designing and implementing big data analytics solutions; implementing server infrastructures; and securing Windows Server 2016. Note: Certification requirements are listed as requirements for 2016. There's no word regarding whether or not these requirements will change in 2017, so candidates should check the MCSE: Cloud Platform and Infrastructure website frequently for current requirements. Microsoft Virtual Academy (MVA) offers free courses and training materials on many topics relevant to the cloud development. Microsoft Learning offers an Exam Replay, which allows candidates to purchase an exam with retake (and practices exam, if desired) for a discounted bundled price. 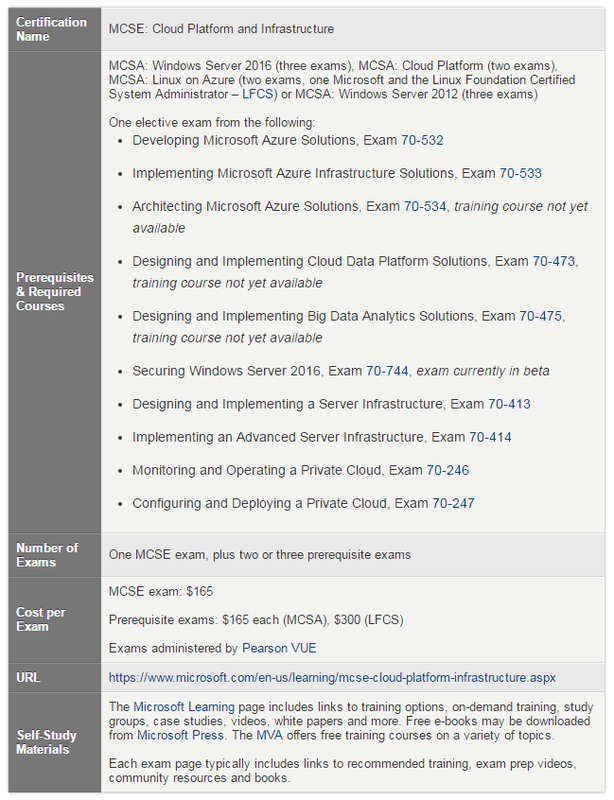 At present, MCSE: Cloud Platform and Infrastructure is the only cloud-labeled administrator certification from Microsoft. However, the MCSD (Microsoft Certified Solutions Developer): Web Applications certification includes an exam devoted to Windows Azure and Web Services. We expect to see more cloud topics sprinkled into Microsoft certifications as more and more Microsoft technologies are delivered and consumed in the cloud rather than on premises. As with most Microsoft certifications, you won't have problems finding plenty of options for training, especially for the company's popular MCSA and MCSE credentials. Here are just a couple of options to consider for the MCSE: Cloud Platform and Infrastructure. Plurlalsight's monthly subscription offers access to thousands of course titles, and among them you'll find 128 different Microsoft cloud-related training courses on a variety of certification topics. The online training courses include exercise files so you can get some hands-on experience, as well as learning checklists and discussions. If you're new to Pluralsight, you can check it out using a free trial. 360training.com also offers several Microsoft cloud-related courses, including video lectures, hands-on demos and student workbooks. The training simulates a one-on-one classroom environment so you get a more personal learning experience, and the included workbooks serve as a study and exam preparation tool. If there's a contributing technology that enables the cloud, it has to be virtualization, and nobody has done virtualization longer or from as many angles as VMware. The company's newest cloud credential is the VCP6 – Cloud Management and Automation (VCP6-CMA) certification, which is based on vSphere 6.0 and vRealize, and recognizes IT professionals who can extend data virtualization throughout the cloud. Path 1 (for current VCP6-Cloud credential holders): Candidates who already possess a valid VCP6-Cloud certification are automatically granted the VCP6-CMA certification. Path 2 (for current VCP credential holders): Candidates who already possess a valid VCP credential need only pass Exam 2V0-631: VMware Certified Professional 6 – Cloud Management and Automation. Path 3 (for expired VCP credential holders): Candidates who hold any expired VCP certifications must take a training course and pass Exam 2V0-620: vSphere 6 Foundations Exam and Exam 2V0-631: VMware Certified Professional 6 – Cloud Management and Automation. Path 4 (for non-VCP credential holders): Candidates who are just starting with VCP6-CMA must gain six months of experience with vSphere 6 and vRealize, take the required training course, and pass the required exams mentioned in Path 3 above. There is one other cloud certification in the works – the VMware Certified Design Expert (VCDX6-CMA). Remember, VMware is updating and replacing certs in its program to reflect new technologies, so check the VMware Cloud Management and Automation certification path site and roadmap for the latest information. 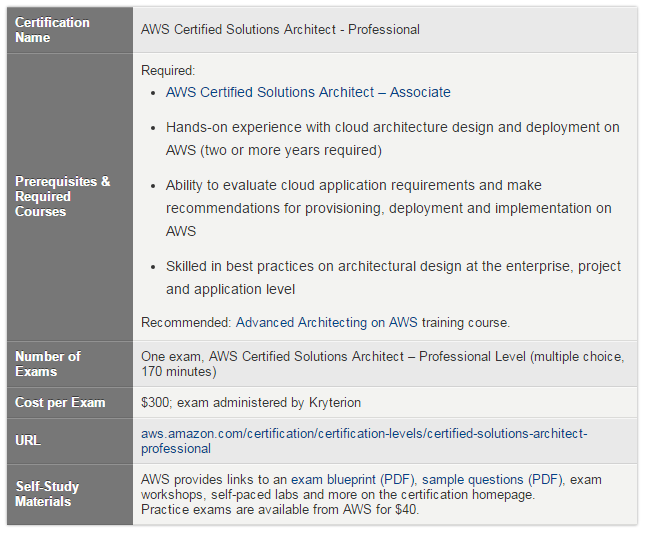 Amazon Web Services launched its AWS certification program in May 2013. The program offers three associate-level and two professional-level certifications. The AWS Certified Solutions Architect – Professional certification aims at networking professionals with two or more years of experience designing and deploying cloud environments on AWS. A person with this credential works with clients to assess needs, plan and design solutions that meet requirements; recommends an architecture to be used for implementing and provisioning AWS applications; and provides guidance throughout the life of the projects. A candidate for this certification should be highly familiar with topics such as high availability and business continuity, costing, deployment management, network design, data storage, security, scalability and elasticity, cloud migration, and hybrid architecture. AWS Certified Solutions Architect – Associate: Identifies and gathers requirements for solution plans and provides guidance on architectural best practices throughout AWS projects. Serves as the prerequisite credential for the professional-level certification. AWS Certified Developer – Associate: Designs, develops and implements cloud-based solutions using AWS. AWS Certified SysOps Administrator – Associate: Provisions systems and services on AWS, automates deployments, follows and recommends best practices, and monitors metrics on AWS. AWS Certified DevOps Engineer – Professional: Provisions, operates and manages distributed applications using AWS; implements and manages delivery systems, security controls, governance and compliance validation; defines and deploys monitoring, metrics and logging systems; maintains operational systems. With Amazon continuing to hold the top spot in the cloud computing services market (Synergy Research), the AWS Certified Solutions Architect – Professional credential is a feather in the cap of channel partners for whom AWS is a major part of their business. The credential also distinguishes partners from their competitors, perhaps giving them an advantage in the pursuit of new clients. In September 2016, Dell Inc. completed its acquisition of EMC. The $60 billion merger is billed by The Wall Street Journal as the "largest technology merger in history." The newly formed Dell EMC company has been branded as Dell Technologies. Candidates interested in the EMC Proven Professional Certifications will still find the same highly developed certification program, with 12 different certification tracks that offer multiple credentials. The only difference candidates will notice is the website now references Dell EMC. Dell EMC offers associate-level certifications in cloud infrastructure and services (EMCCIS), data science (EMCDSA), information storage and management (EMCISA), backup recovery (EMCBA), and enterprise content management (EMCPA). Higher-level certs include the Data Center Architect (EMCDCA), Cloud Architect (EMCCA), Storage Administrator (EMCSA), and several more geared toward engineers, developers and administrators. Although EMC certifications are good for life, the company recommends updating your certifications every three years to stay current on new technology. The EMC Cloud Architect (EMCCA) track, which is the focus of this section, includes three certifications: Associate, Specialist and Expert. All of these certifications have recommended or required training courses, the cost of which range from $600 for on-demand instructor-led streaming to $5,000 for instructor-led in-classroom delivery. Exam vouchers are included in the training cost. Candidates who are currently active military, veterans or family members are eligible for reimbursement for exam fees. Other cloud certifications from EMC include those in the Cloud Engineer (EMCEE) track, which has Associate and Specialist levels; however, you must be an EMC partner to achieve these certifications. There's no overall shortage of cloud-related certifications (nor certificate programs that also attest to cloud competencies). As it's a major player in network infrastructure and cloud technologies, many are looking to Cisco to see what it offers in the way of cloud certifications. Currently, Cisco offers the entry-level Cisco Certified Network Associate (CCNA) Cloud certification. 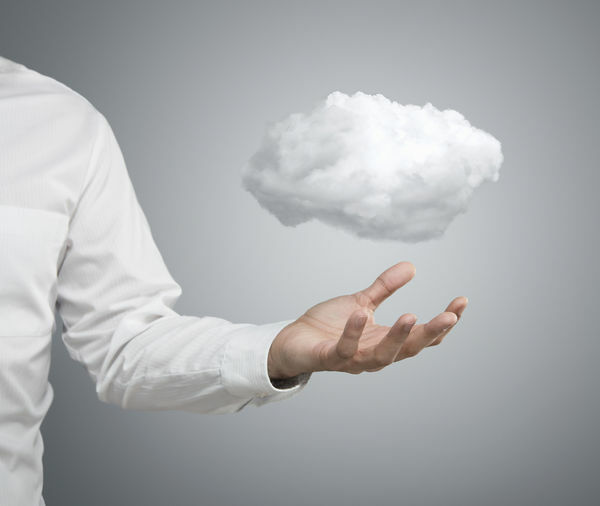 Numerous other vendors also recognize the importance of cloud certs. For example, HPE, IBM, Google and Oracle offer cloud credentials. Google currently has two Google Certified Professional credentials under development — Cloud Architect and Data Engineer. Beta exams are underway, and interested candidates can sign up on the respective certification webpage to receive notifications of exam availability. You'll also find cloud certifications from well-known companies such as Rackspace (CloudU), CA AppLogic and Salesforce, and the Certified Cloud Technology Professional (CCTP) is a good vendor-neutral certification for those who are just getting started with cloud technologies and aren't tied to a specific platform. The cloud phenomenon is still peaking, and certification providers are jumping on the cloud in a big way. Check out Miroslaw Burnejko's excellent (but somewhat dated) List of Cloud Certifications for a pretty exhaustive catalog of what's out there right now.